X-disease has been diagnosed in several peach orchards in northern Ohio. Once the disease is established in an area or orchard, it can be very destructive. The disease has been reported to occur primarily in the Great Lakes states and in the province of Ontario, Canada. The range of distribution for X-disease corresponds to the range of distribution of the wild chokecherry, which is a major reservoir of infection. X-disease can affect peach, nectarine, sweet cherry, and sour cherry. Figure 1. 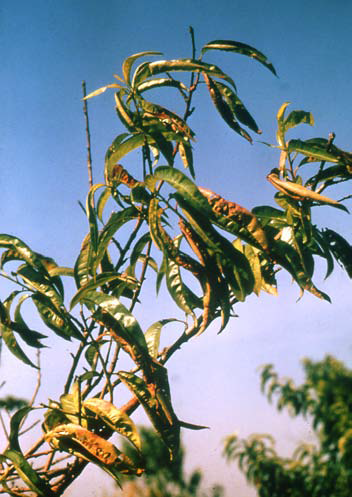 Symptoms of X-disease on peach leaves. Symptoms on cherry and peach may be variable, depending upon the environment, variety, and possibly other factors. However, once acquainted with general symptoms, one should be able to recognize the disease more often than not. This disease is most easily identified on peach. Symptoms are predominantly foliar, but the fruits may also be affected. The first symptoms occur on foliage in midsummer. Leaves on isolated branches curl inward and develop irregular, yellow to reddish or purple spots. The spots soon drop out, leaving a shothole effect and tattered leaves. Leaves on affected branches fall prematurely, starting at the base of the branch. Eventually, only a tuft of leaves remains at the tips of infected shoots. A good diagnostic symptom is the presence of apparently healthy twigs or branches with normal-looking leaves mixed with twigs or branches showing the symptoms described earlier. 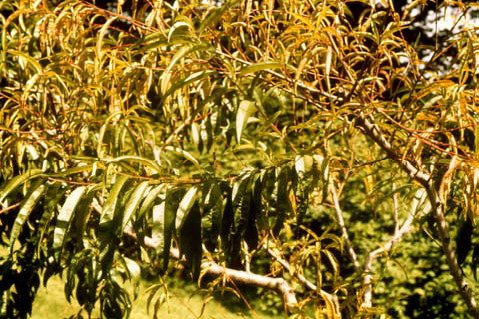 This mixture of healthy and diseased branches on the same tree occurs primarily during the first and second years of infection. Two to three years after initial infection, most branches will show symptoms. Another important diagnostic aid is to pull a tree and examine the roots. Foliar symptoms of yellowing and stunting can also be caused by Phytophthora root rot, which has also been observed in several northern Ohio orchards. With Phytophthora root rot, the above-ground symptoms are usually fairly uniform throughout the canopy of the tree. You generally will not see a healthy branch on the tree with all other branches showing symptoms. In addition, the crown and/or roots of a tree with above-ground symptoms caused by root rot should have visible, rotted areas. These areas are generally brick-red to brown in color and are often characterized by a sharp line of demarcation between healthy and diseased tissue. Roots on trees affected by X-disease appear normal. Fruit set on trees infected with X-disease may appear normal at first, but fruit on infected branches will usually drop prematurely. Figure 2. X-disease on peach. Note the apparently healthy branch among severely infected branches with strap-shaped leaves. There are two major types of reaction to X-disease in cherry trees. While there are exceptions in both cases, in general these two types can be described with reasonable safety as totally different reactions. The rootstock is the key. Trees on mahaleb rootstock generally react differently to the disease than do those on mazzard rootstock. Cherries on mahaleb rootstock are killed suddenly in midsummer by the disease. Trees on mazzard rootstock decline slowly. Infected sweet cherry trees on mazzard rootstocks may not show decline for many years; often the only recognizable symptom is on the fruit. Scattered fruit on trees propagated on mazzard rootstock are small and pink at harvest and have a bitter flavor. Sour cherries seem to be a little more seriously affected in that dieback and decline are often associated with the disease. X-disease was believed to be caused by a virus until structures resembling mycoplasma were discovered in association with diseased plants. Mycoplasma are small parasitic organisms that have long been known to cause disease in plants, animals, and humans. The organisms produce spherical- to ellipsoid-shaped bodies that are smaller than bacteria but larger than most virus particles. Mycoplasma live in phloem cells of plants. The phloem is a network of cells for moving foodstuffs manufactured in the leaves to other parts of the plant. X-disease can be transmitted by several species of leafhoppers. These leafhoppers acquire the X-disease pathogen while sucking juices from the leaves of X-disease-infected chokecherries. Wild chokecherry is an important reservoir for the X-disease mycoplasma. Two to three weeks later the leafhopper can inject the agent into healthy leaves while feeding. These leafhoppers are usually not considered pests of peach and cherry. The main damage they cause is the incidental transmission of X-disease. Movement of leafhoppers, and therefore X-disease, can also occur from infected sweet and sour cherry, particularly from trees on mazzard rootstock. Although the possibility of spread from peach to peach has been investigated many times, it appears to be of minor importance. Control measures aimed at eradicating chokecherries near stone fruit orchards help to control X-disease. Chokecherry bushes are commonly found in hedges, along property lines, in open woods, and in overgrown meadows and abandoned fields. Brush killers offer the cheapest and most effective way to kill the chokecherry bushes with both summer and autumn spray treatments. Other removal methods include bulldozing, deep plowing, burning, or pulling out individual bushes. During the growing seasons following removal, check the treated area carefully for chokecherry sprouts. Sprouts or new chokecherry seedlings should be treated with herbicide sprays or pulled out during the summer. Reducing populations of leafhopper vectors is another approach to X-disease control. Maintaining a vigorous insect control program from June through harvest with insecticides effective against leafhoppers should be useful in reducing spread of the disease. Remove infected cherry trees near peach orchards. X-disease is often very severe in young peach orchards planted next to old cherry blocks with X-disease-infected trees on mazzard rootstock. Chokecherry is often confused with wild black cherry and wild pin or fire cherry. It is important to be able to distinguish this species from others, because only chokecherry is important in the spread of X-disease. Unlike black cherry and pin cherry, which grow like trees to 50 feet or more, chokecherries are shrubs up to 15 feet tall. They are usually found in clumps. The fruit of chokecherry, which is produced along a central stem, is black when mature and ripens before those of black cherry. The calyx cup on chokecherry fruit does not persist as it does on black cherry fruit. Pin cherry fruit are borne in clusters like sour cherry and in no way resemble those of chokecherry. Chokecherry leaves are wider and broader than black cherry or pin cherry leaves. Serrations along the margin of the leaves are more prominent and spreading than those of the other two species.